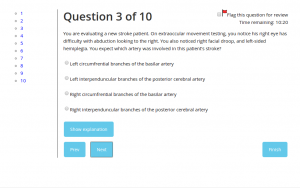 PM&R quizbank: multiple choice questions for exam review! Prepare for exams in PM&R: student assessment exams, part I certification, and recertification exams. Answer 223 unique questions (and growing) written by physicians in PM&R. Educational explanations and references for further study. Track your performance and progress with basic quiz history and statistics. Inexpensive, because who doesn’t like that? Take a sample quiz–no registration required! Today we introduce our PM&R Quizbank 2-week “cram” subscription, for your last-minute studying. Get access to all our Quizbank features with 223 high-quality, board-style, multiple-choice questions, with detailed explanations and references for further study. Happy studying, and best of luck on the exam! Timed tests, flag for review, more questions, and more! You now have the option to have your test timed. You get 65 seconds for each question–just like on the board exam. Look for this option on the quizbank setup screen. You can flag questions for review, and take a quiz of the questions you have marked. You can flag questions during the quiz or when reviewing your results. 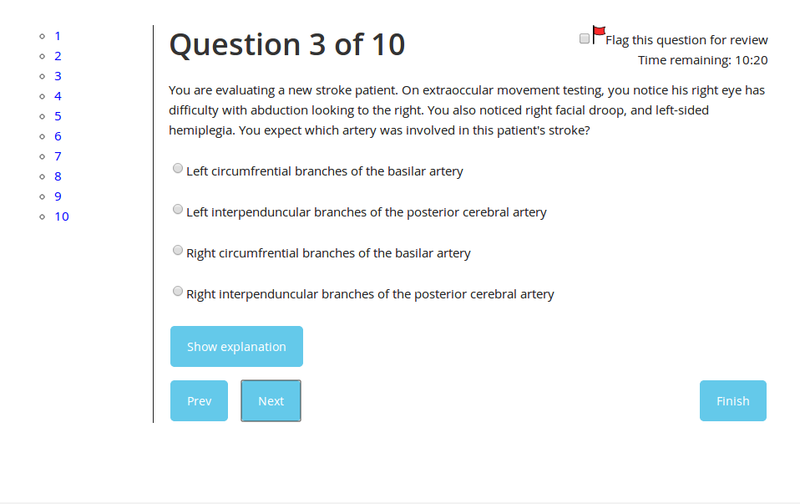 Look for the option to take a quiz of flagged questions on the quiz setup screen. Too tempted to view the explanations and answers during a quiz? Now you can hide them with the Test Mode option. If you want the explanations available during the quiz, select Tutor Mode. The quizbank now has 200 questions. There is an option to take a quiz with only questions you have not taken before, so if you’ve exhausted what was there, you can get just the new ones. You can now see a breakdown of how you’re doing by category, including how many questions you have taken in a category, how many of them you got correct and incorrect, and left unanswered. Just go to the Quizbank page. We now hide the header, menu, and footer during your quiz. It’s just you and your questions! We have improved the jump-to-question functionality, including indicating which questions are answered and which are not. Enjoy the updates, and happy studying! We’ve got our own new logo. We love it; hope you do too! We’re targeting another round of update for early June. The two biggest items are more questions (of course) and awesome statistics. We will also give you the ability to flag questions for review. We plan to get these features out to you in plenty of time to study for boards! Pmrrc.com is a product of Marsolek and Boldt, LLC and is not affiliated or associated with the American Board of Physical Medicine and Rehabilitation (ABPMR).